Cosy self catering apartment sleeping two people. Stay in our self catering apartment at Appletrees Guest House. With it’s own private entrance, the apartment is entirely self contained and consists of one bedroom with a king sized bed and en suite bathroom. The open plan lounge is simply furnished with a sofa and TV and kitchenette with a cooker, oven, fridge freezer, kettle, toaster and microwave. The apartment welcomes small children in their own travel cot and is also dog friendly (£5 extra per night per dog). If you fancy breakfast along with our B&B guests, this can be included for £6.95 per cooked breakfast or £4.95 per continental breakfast. See photos of the self catering apartment at Appletrees Guest House. 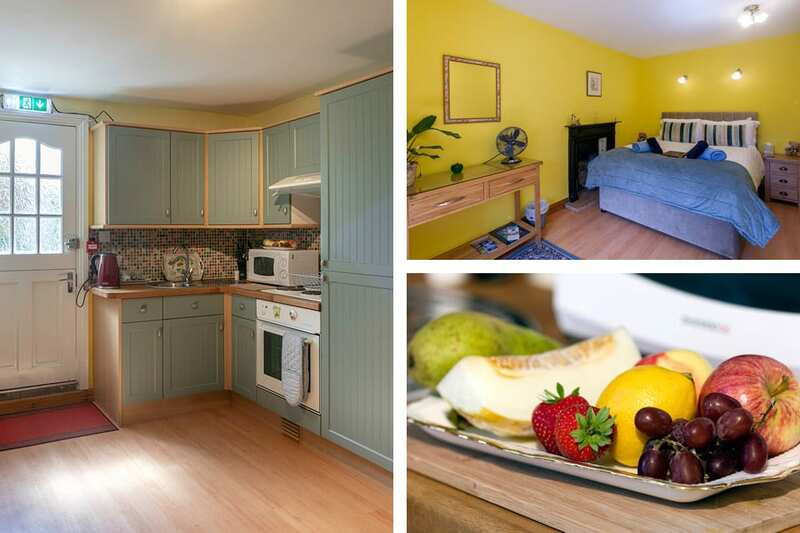 View the full gallery for more photos of our Keswick B&B accommodation. You can check up-to-date availability and book your stay with us online instantly. If you have any questions please contact us.